Pluto and Flagstaff, Arizona are forever linked in history. On February 18th 1930, the astronomer Clyde Tombaugh discovered Pluto at Lowell Observatory in Flagstaff using a blink comparator and photographic plates taken at the observatory. Eighty five years later, NASA’s New Horizons probe reached the Pluto system, imaging Pluto, Charon, and the other small moons. In celebration of the 85th anniversary of its discovery and the arrival of New Horizons probe, the year 2015 has been designated the “Year of Pluto”. To celebrate, the members of the Northern Arizona DX Association (NADXA) are sponsoring a special event using the call sign W7P from 0001Z December 5th to 2400Z December 13. Operations will take place at Lowell Observatory from inside the Pluto discovery telescope dome, as well as from the homes of club members using both CW & SSB. There will also be a very special guest operator; Doug Tombaugh N3PDT, nephew of Clyde Tombaugh who will operate for three days during the early part of the event. Pluto and the City of Flagstaff, Arizona, are forever linked in history. On February 18, 1930, astronomer Clyde Tombaugh discovered Pluto at Lowell Observatory in Flagstaff, using a blink comparator and photographic plates. The New Horizons probe reached the Pluto system 85 years later last July, imaging Pluto, its largest moon Charon, and the other small moons. 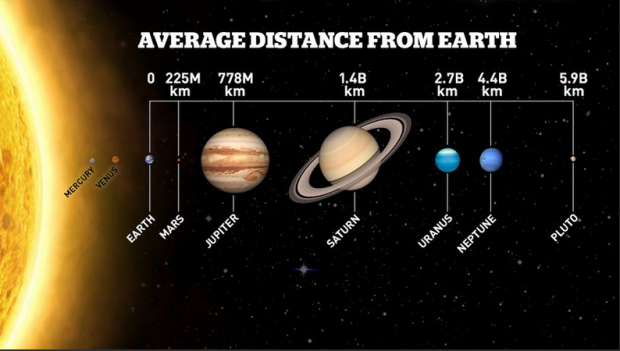 Pluto has since been downgraded to “dwarf planet” status. 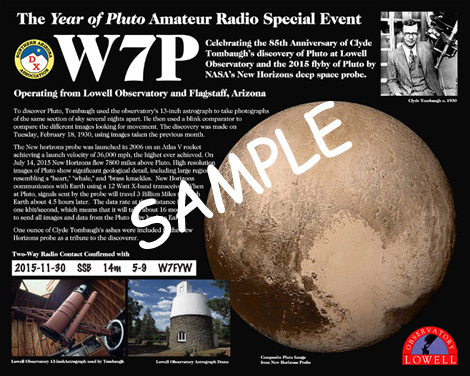 Nonetheless, 2015 was designated the “Year of Pluto.” To celebrate, the members of the Northern Arizona DX Association (NADXA) will mount special event station W7P starting at 0000 UTC on December 5 and concluding at 2400 UTC on December 13, from Lowell Observatory. W7P operators will be on the air from inside the Pluto discovery telescope dome, as well as from club members’ homes. Operation will be on SSB and CW. Special guest operator Doug Tombaugh, N3PDT, the nephew of Clyde Tombaugh, will operate for a few days during the early part of the special event period. QSLs and a certificate are available. Visit the NADXA website for more information.